We don’t inherit the Earth from our parents. Look after the land and the land will look after you and future generations. WHAT IS BIODIVERSITY? WHY DOES IT MATTER? 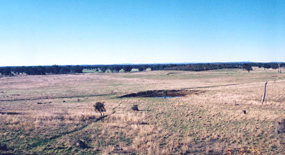 By comparison with the northern hemisphere, Australian soils are mostly shallow, infertile, nutrient depleted and fragile. (There are some exceptions; e.g. Liverpool Plains.) Our continent is the flattest, lowest and driest on earth. Our mean elevation is 300m compared with the world mean of 700m. The eastern quarter has only been above sea level for 60 million years. Low relief contributes to low rainfall. As there is little water to weather rocks and transport material, little soil formation occurred across most of the continent for millennia. 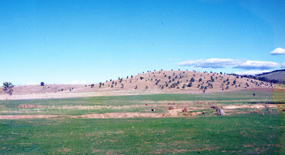 When northern hemisphere soils were being renewed by glacial weathering during long arid periods, Australian soils were being depleted by wind erosion. Natural flora and fauna evolved with the soils, so native flora copes well on low nutrient soils. Fauna do minimal soil damage, thanks to soft feet and relatively small size. Unfortunately, after two centuries of clearing native flora for agriculture, Australia’s biodiversity is in a parlous state. Across much of the land, soil and water degradation is severe and many native species extinct. (David Lindenmayer ‘On Borrowed Time’) (see Powerful Statistics below). The urgent challenge facing Australia is finding effective ways to restore biodiversity and ecosystems across agricultural land. The continuation of productive farming on our continent’s ancient soils depends on renewing and sustaining biodiversity. This makes biodiversity not only an environmental issue but also a food security and national security one as well. Restoring biodiversity on farm land is our responsibility to future generations. Land and people are not dissimilar. If we worked 24/7 without nourishment and shelter, we’d become incapable. The same applies to land when we strip its native vegetation cover and fail to replenish what we take out. Biodiversity and ecosystems collapse and land eventually loses its capacity to produce quality goods. 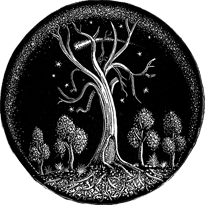 Land that is cared for seethes with dynamic micro-organisms interacting above and below ground. It’s alive and productive. 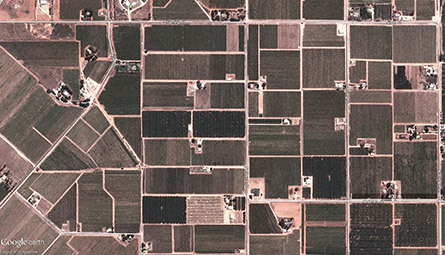 The most cost-effective measure for restoring biodiversity is to replace significant levels of native vegetation cover across farm landscapes in a networked pattern. This has multiple positive benefits, not only on the land on which flora is growing but also on the adjacent landscape.Return of native flora helps to catalyse the natural restoration of bio-diversity. It recycles nutrients, restores health to ecosystems above and below ground, it creates habitat and stores carbon. A glance at some comparative statistics on Biodiversity and Farm Production in Australia tells a powerful story of the need for our nation to adopt new approaches to farming and land management. Australia is host to over 10 per cent of the world’s species, making it one of the most important biodiversity places on the planet. But the following figures show we face an extinction crisis. Australia is the driest continent on the planet, has extreme weather patterns and thin, ancient and soils. In spite of these factors, Australian farming plays a critical role in our national food supply and economy. Our land’s capacity to produce quality food for the long term is crucial to food security, national security and regional economies. Producers and consumers, rural and urban – we all have a stake in restoring biodiversity and supporting sustainable farm practices. 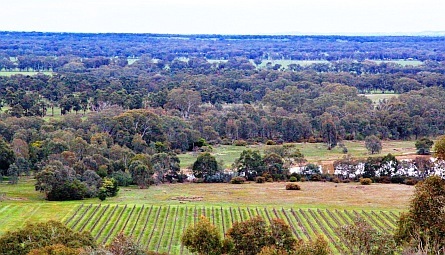 Wine production is regarded as the ‘canary in the climate change coalmine’ because of its unique relationship with terroir. A warming, drier climate inevitably impacts on the relationship between grape varietal and terroir. As wine writer and judge Max Allen astutely observes, this critical relationship requires the wine industry to respond with a ‘polar shift’ in the ways we think about wine production and approaches we take to climate change adaptation. Climate change is influencing the wine industry profoundly. All global wine regions are warming. 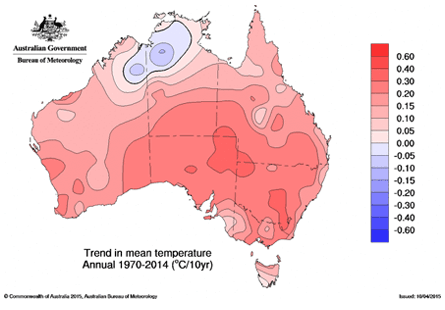 Australia experienced an overall warming of 0.8oC in the past three decades. Further warming of 1-2oC is anticipated by 2050, as is drying in southern parts of the country. Increased temperatures and lower rainfall in south-east and southwest of the continent pose big challenges to biodiversity, agriculture and viticulture. Increased temperatures mean grapes now ripen on average three weeks earlier than previously. 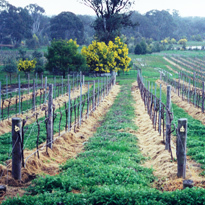 Research led by Professor Snow Barlow et al at the University of Melbourne shows that over the last 25 years vintages have moved forward by 0.8 days per year. Grapes now ripen in temperatures 2-4oC higher than previously. Because ripening takes place earlier in the season, it is happening during hotter summer days instead of in autumn. These factors can influence the characteristics of wines. Earlier onset of ripening means multiple varieties may now ripen at the same time, so compressing vintage and putting pressure on winery capacity. 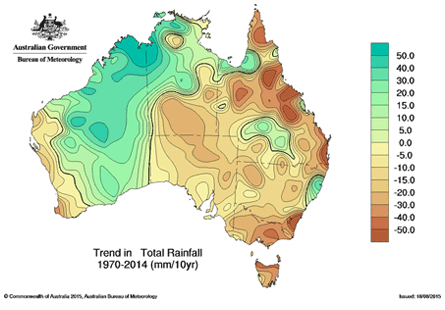 Areas in southern Australia are also experiencing decreased rainfall. 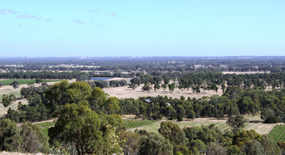 Research conducted by Professor Clive McAlpine et al at the University of Queensland indicates the removal of native vegetation is a “likely contributing factor to the observed surface trends in surface temperature and rainfall at the regional scale”. 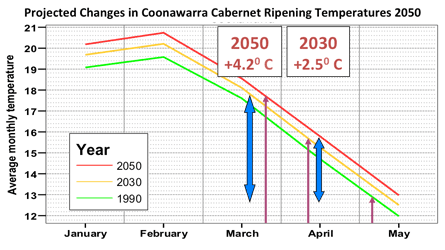 The wine industry is attempting to deal with increases in the number and intensity of extreme weather events. 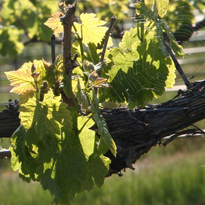 Recent unseasonal frosts around bud-burst can wipe out a whole year’s vintage. Baddaginnie Run response to this threat is to prune a little later in the year, aiming to delay budburst and avoid fruit-loss caused by late frosts. The key to successful adaptation is to engage with these new challenges and where possible identify new opportunities these might present. As wine producers we have a responsibility to respond to on several fronts. We need to foster adaptations relating specifically to wine production. We need to review the impact of our practices on land health and vineyard terroir. And with other industries, we need to play our part in reducing and mitigating the impact of climate change on society. The wine industry is responding to specific wine-production challenges with new adaptation and management strategies. 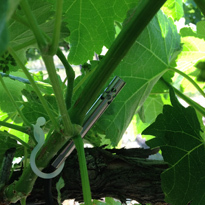 These include exploration of new wine-styles and changes in irrigation and canopy management techniques. Some are even replacing existing varietals with new ones more suitable to warm, dry climes. 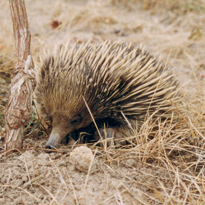 But it’s also important wine producers examine ways to mitigate the impact of climate change on the unique bio-diverse ecological communities that underpin Australian viticulture. After two centuries of clearing, landscapes are fragmented, which weakens the ability of ecosystems to adapt to climate change and inhibits natural processes of species evolution and gene migration. 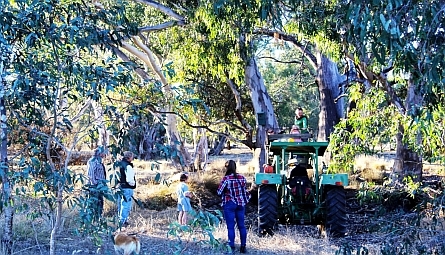 Baddaginnie Run’s climate change adaptation / mitigation strategy is focussed on replacing and connecting native flora cover. We aim to restore above and below ground ecosystems and microorganisms, store large volumes of carbon, and maximise water retention. While individual plants take water from the sub-soil, their leaf litter helps reduce soil evaporation. 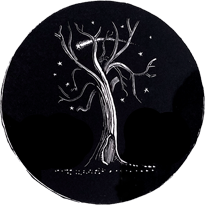 Recent global research suggests that critical masses of deep rooted trees will ‘evapotranspirate’ over long periods of time, cooling the surface and putting moisture into the atmosphere which is then available to fall again as rain. We also hope bio-corridors will help make surface temperatures a little cooler in summer by providing shade and also shelter from hot winds for vines, stock, fauna and dams. With neighbours we aim to extend bio-corridors into a 5 km migratory pathway that assists whole ecological communities adapt to climate change. When complete this network will span an altitudinal gradient of 250 metres and a temperature gradient of 2.5oC. Restoring biodiversity also helps us produce complex wines that reflect the distinctive characteristics of our terroir. One important terroir element is the suite of diverse native yeasts living in the vineyard. These play a critical role in maintaining vineyard health, in enabling climate change adaptation, and in producing high quality grapes. Paradigm shift: Generally in Australia land is seen as a resource capable of being exploited forever. This paradigm needs to shift to respecting land as the source of all life. We each need to consider the impact of the decisions made today on the land’s ability to sustain future generations, and focus on quality goods rather than on cheap mass production of quantity. Policies and strategies: We need long term government policies and strategies for assisting farmers restore biodiversity. Programs: We need public programs that support farmers in putting back into the land what generations have taken out. Government obliged early settlers to clear the land. And Australian farmers can’t secure sufficiently high prices in global markets to pay for the massive job of restoring the native vegetation cover needed for sustainable farming. Promotion: We need to get the message out about the direct links between food security and biodiversity for current and future generations. Partnerships: We need local, state and national partnerships: between growers, manufacturers and consumers; between urban and rural groups; and between governments, environmentalists and industry. Food security will finally only be achieved by changes at the local level in farm management practices, ones that integrate restoration of biodiversity with production of quality goods. Replacement of native vegetation as bio-corridor networks is a powerful, practical method for restoring farm ecosystems and biodiversity. 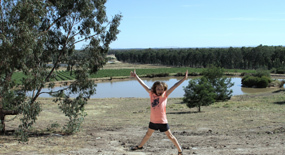 Bio-corridor networks are the areas of land on which native vegetation cover is being protected, restored, regenerated and then linked to other areas of bush via new plantings and natural regeneration. Protecting … new native flora from pests, weeds and dehydration.